Two years ago the news was publicly broken on this site that 99.9% of Australia's Gold reserves are stored by the Bank of England in the United Kingdom. Attempts by another blogger, interested in the whereabouts of Australia's Gold, had been rejected by the RBA only several months earlier, "The Bank does not publish the location of its gold reserves." Decisions like this don't happen in a black hole. Something changed the RBA's mind, between August 2012 and December 2012, on making the location of Australia's Gold reserves public. From my observation, the RBA tends to follow the lead of other Central Banks, so the decision to release information on the location of Australia's Gold may have been a result of Germany's Central Bank (Deutsche Bundesbank) deciding to do so in October 2012 (interview containing the information originally released is no longer published on the site, but available via Web Archive). Only a month later, in November 2012, the Austrian Central Bank released the location of their Gold reserves, revealing that 80% resided in the UK, 3% in Switzerland and 17% in Austria. Cue the RBA feeling comfortable to release the location details of Australia's Gold around 1 month later. A recent experience of mine with the RBA further highlighted their desire to follow in the footsteps of other Central Banks rather than to think for themselves. An FOI request I made for the Gold bar list was initially rejected, but after lodging an appeal with the OAIC, highlighting that the United States published a list of their Gold bars details (sans the serial number), the RBA decided to follow suit (Reserve Bank of Australia Releases Gold Bar Details). A question posed by email to the RBA earlier in the year suggested that RBA officials had performed the audit themselves. I decided to lodge another FOI request. "I request that a copy of the following documents be provided to me: All documents pertaining to the audit of the RBA's gold holdings performed during the 2013/14 financial year, as was specified in the 'Operations in Financial Markets' section of the Reserve Bank of Australia Annual Report 2014 ("During the year in review, the Bank audited its gold holdings")." 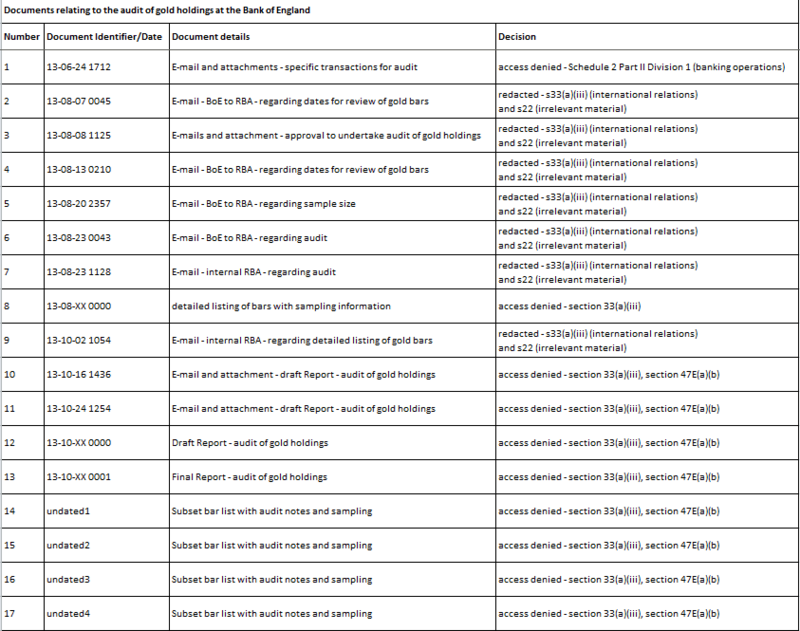 In February 2013, the Assistant Governor (Financial Markets) requested Audit Department include in its audit program a review of the Bank’s gold holdings at the Bank of England (BoE). The Chief Representative in EU approached the BoE to facilitate this review and in late May 2013 initial planning discussions were held with BoE staff with tentative agreement that the review would take place in September 2013. 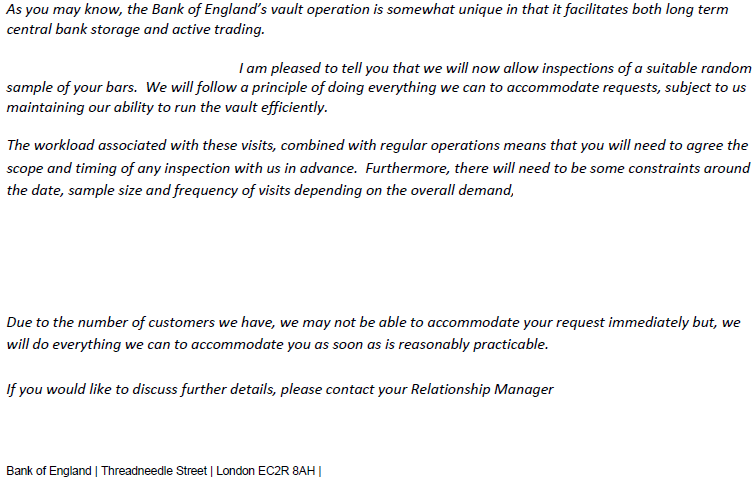 An on-site physical verification commencing 23 September 2013, which will take 4-5 days to complete, assuming two RBA auditors are involved given the proposed scope. Inspecting a sample of RBA Gold bars (list to be provided in advance), including checking the details of these bars against the Bank’s inventory list and weighing of the bars by BoE staff using their equipment. Randomly selecting additional Gold bars from the inventory list and observing these bars being located and retrieved from their vault (plus verifying the details and weighing them). Obtain a high level understanding of the BoE gold safe custody service. Continuing discussions for a comprehensive safe custody agreement between the RBA and BoE. Documents 10, 11 and 12 are drafts of the report prepared by the RBA’s Audit Department detailing the findings of the audit and document 13 is the final of that report. Denial of access to these four documents in terms of s33(a)(iii) is appropriate because release of the information (which relates to procedures for the conduct of the audit with the BoE and the subsequent results) ‘would, or could reasonably be expected to, cause damage to’ the relationship between the RBA and the BoE. This belief is soundly held by us on the basis that we are aware that the BoE provides safe custody services not only to the RBA, but also to other central banks around the world. Disclosure of the information in these documents could damage the relationship between the BoE and its other central bank clients, and by extension (as the source of the information), the relationship between the BoE and RBA. As foreshadowed to you in earlier correspondence, we consulted with the BoE in relation to these documents and they affirmed the views we held regarding the damage that would be done to the relationship between the BoE and RBA if the redacted information were disclosed. (d) allow a person to access his or her own personal information; the request is not seeking personal information. Taking into account these factors, and the implications release of the information would have on the Bank’s audit processes, I have decided that it is clearly not in the public interest to disclose the information in these four documents (10, 11, 12 and 13). Disclosure of these documents would manifestly harm the public interest by way of reducing the ability of the RBA to successfully conduct audits and tests of its operations going forward. The released documents (mostly a chain of various emails) also suggested the RBA have been invited back for another review in 12 months. However discussions on the RBA audit were already well advanced at that time. I'm sharing links and opinions daily on Twitter.